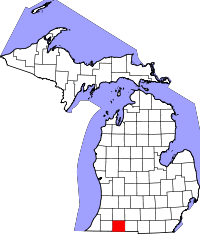 Shiawassee County is located directly in the center of Michigan, and in fact, the actual center of population is the town of Morrice, a very small town with only 882 residents. The town of Corunna is the county seat and is the location of the County Clerk Vital Records Department. The storage method of records in the department is dependent upon the actual age of the records. Birth, death, and marriage records are all listed from 1867 to the present, however those dated from 1867 to 1933 are kept in ledger books, and subsequent ones are kept on microfilm. Divorce records are also available from 1861 to the present, along with naturalization papers listed from the 1890s to the 1960s, and veterans discharge papers recorded from 1865 to the present. In addition to physically visiting the office, the Clerk's website has mail-in request forms that can be sent in along with any required payment.